Easily the most ornate ride on the fairground. 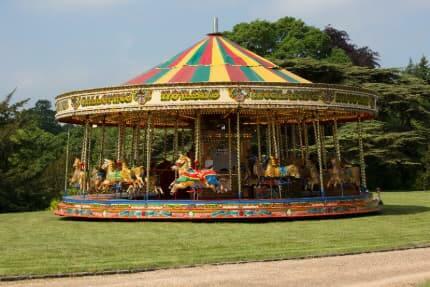 The Carousel, or “Galloping Horses”, dates back to the golden era of steam. This is not only a funfair ride suitable for young and old, it also makes a brilliant backdrop for wedding or promotional photos. Not as fast and stomach churning as some of our thrill rides, this is nonetheless still one of our most popular attractions and makes an undeniable statement at your event. Probably the most iconic funfair attraction of all time, the Carousel is available in both full sized and miniature (for children only) forms. 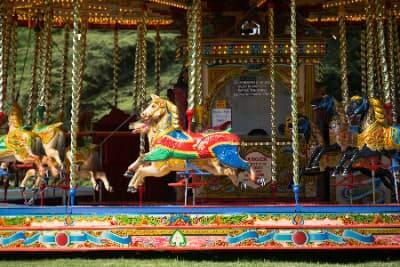 A number of spectacularly decorated horses, galloping up and down as the ride turns, along with a selection of chariots, suitable for adults and children. When you add the overall presentation, with acres of gold leaf, fabulous coloured lights, and when available, an authentic vintage organ, there is very little out there that makes such a stunning centerpiece for your event. When hired with other traditional rides such as the helter skelter, or ferris wheel, you have a perfect package for Victorian themed events. 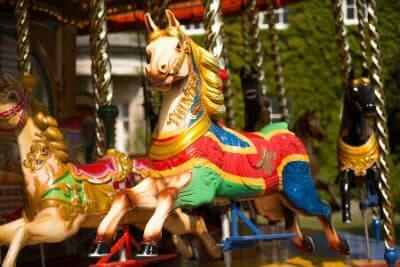 The original funfair rides were small merry go rounds, usually powered by either the operator himself (or probably a selection of children) or as things progressed, a mule or donkey. A farm engineer by the name of Frederick Savage in 1868, invented a method of powering a funfair ride via a horizontally mounted steam engine in the centre. This allowed for much larger rides carrying greater numbers of passengers to be created. 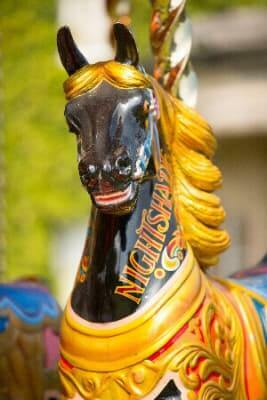 Indeed in a short time period, many of the huge ornate carousels began to populate events up and down the country. The carousel pictured above, still has its original steam engine in place, though it is no longer usable. Eventually steam gave way to the new fangled elastic trickery stuff, more commonly known as electricity, and rides gradually switched over to this cleaner power source. And any other legal documentation currently required. Hire funfair carousel fairground rides throughout the U.K., including London, Scotland, The Midlands, The North East, Lancashire and Yorkshire, perfect for college events, military functions, weddings, parties, corporate functions, private hire, corporate events, exhibitions and company fun days.